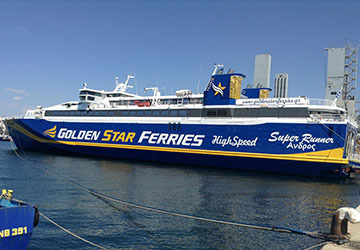 Golden Star Ferries’ Super Runner is the newest high speed craft in their fleet. The modern vessel has an 809 passenger capacity and delivers travellers to their destination at speeds of up to 38 knots. As well as the ability to carry a large number of travellers, there’s also space for 180 vehicles on the garage deck. The ship is equipped with comfortable airline style seating with enough for everyone to sit and relax whilst on their journey. The Super Runner is fully air conditioned and comes with a shop, café, satellite televisions and has a number of cabins, including ones specially adapted for those with restricted mobility. Luxurious cabins are available for voyagers on this Golden Star Ferries service with comfortable beds providing the ideal opportunity to relax and get some sleep whilst on your travels. However, you don’t have to book a cabin to have a relaxing journey. There’s a large amount of aircraft style seating distributed throughout the ship. A great choice of food and drinks are served at the Golden Café coffee shop, including meals and snacks, barista style coffee, soft drinks and alcoholic beverages. Satellite televisions are situated in the lounges and seating areas on this state of the art fast ferry, allowing you to sit back in the comfy seats and while away the hours in front of the various screens. There is Wi-Fi provided to those on board, meaning you don’t have to lose touch with those in the outside world, fall behind on work or miss out the latest news and entertainment. Designated areas are provided for both smokers and non-smokers, depending on your personal preference. The ferry is adapted to cater for those on board with restricted mobility. There are elevators to help move between decks and specific cabin accommodation for passengers with special requirements. Please Note: Whilst we have taken great care in making our Super Runner guide as accurate as possible, onboard facilities, services and entertainment may vary depending on the date and time of year that you travel, facilities mentioned may change without notification and ferry companies reserve the right to operate vessels other than those mentioned at time of booking without prior notification.